The escape from a straight jacket was original with Houdini. He claimed that he visited St. John Asylum in New Brunswick in 1896 and saw an inmate there struggling inside a straight jacket and this struggling gave him an idea for both an escape and the method. He also claimed to have asked a doctor for a jacket and worked on it for a week, no doubt practicing and improving his time. 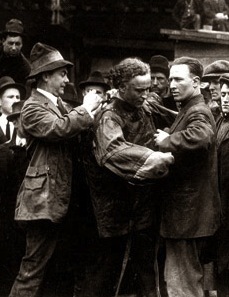 The Ken Silverman HOUDINI biography speculates that Houdini may have presented the straight jacket escape in New Brunswick theatres at that time. In August 2011, John Cox wrote a great article on his blog WildAboutHarry, about an apparent dispute over that story being accurate. 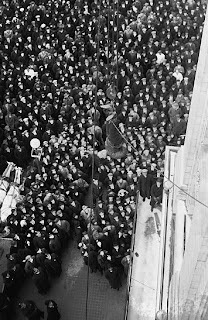 Harold Wright, a historian in New Brunswick claimed the story was a myth made up by Houdini. Interestingly, in the May 1918 issue of Ladies Home Journal, Houdini says that the asylum was actually in Europe. So perhaps, the story was indeed fictional. True or not, escaping from a straight jacket was a great idea and one Houdini profited from both financially and through publicity. The first official straight jacket escape however took place in San Francisco not in front of a theatre audience but instead at a police station. He repeated the escape a few days later at a hospital. Both times he was placed in a private room to work his escape hidden from prying eyes. When he added it to the stage show Houdini would be strapped in the straightjacket and then placed inside a curtained cabinet. My guess is he used the Metamorphosis cabinet to do the escape. Hidden from view, Houdini did his escape. I don't see any records that say Houdini's escape was boring or suspect. I would imagine like most things that Houdini did, the audience totally bought it. But his brother Dash was not so lucky. In 1904 at the Swansea Empire Theatre in Wales, Dash's attempt with the escape was met with skepticism. The audience challenged him to do it in the open, thinking that he had a hidden helper in the curtained cabinet who simply released him. Presenting it in the open would prevent any outside help. Dash repeated the escape and stunned the crowd. Somewhere there must be a letter or telegram from Dash alerting Houdini of the sensational discovery. One thing is for sure, Houdini too began doing the escape out in the open and left the curtained cabinet behind! Another straight jacket perk that came out of England was the idea of hanging upside down while escaping. Except, the idea was not Harry's or Dash's, it was actually the idea of a young fellow by the name of Randolph Douglas, who chose the stage name Randini. 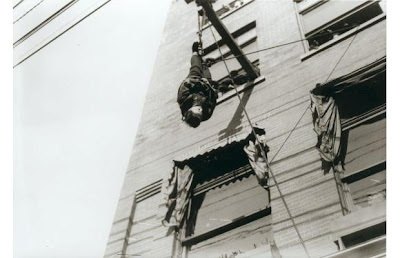 Houdini and Randolph became friends and during a visit to Randolph's home in Sheffield, Houdini watched the young man demonstrate the hanging upside down escape from a framework in the attic of the house. Houdini's addition to the idea was doing it outdoors from a building, which you must admit was a pretty decent contribution. UPDATE: Turns out the previous paragraph might not be accurate. There was another performer who very well might have been doing the Upside Down Straight Jacket Escape prior to Houdini and Randolph Douglas. His name was Mysterio and was also known as The Great Alvin. You can read more about him here. 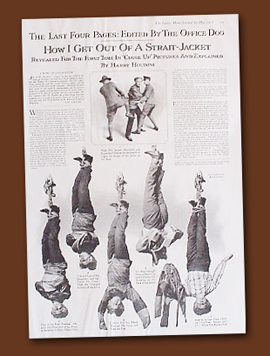 Over the years, Houdini accepted challenges from all sorts of straight jackets, and full body canvas devices. Some of the jackets were all leather, some were a combination of leather and canvas. One thing they all had in common, Houdini got out of each and every one of them. Then in 1918, he exposed his method (kindof) in the Ladies Home Journal. He claimed that he dislocated his shoulder in order to do the escape. But the truth was less dramatic. Dislocating a shoulder is not necessary, but it sure sounds exciting! Houdini kept doing the straight jacket escape pretty much until the end of his career as far as I can tell. It's certainly an easy thing to travel with and the publicity he gained from hanging upside down from a building was priceless. After Houdini died, other magicians began to add the straight jacket escape to their acts. Some even copied his upside down publicity idea. One of the first twists to the upside down part was setting the rope on fire. It was Alan Alan in the 1950s who added this unique change to the hanging straightjacket escape, though Alan gives the credit to fellow magician Keith Clark for the idea. Alan Alan may have been the first to present the escape hanging upside down from a helicopter. James Randi, later presented the upside down straight jacket escape from a helicopter in Venezuela and also hung upside down over Niagara Falls in a straight jacket! In 1967 in Oakland California, a magician who was using the stage name 'The Great Gerhardt' hung upside down outside of the Tribune Tower Building. Forty four years earlier, Harry Houdini hung outside the same building to present the straight jacket escape. It took Houdini several minutes to get out. This young fellow, whose real name was Steve Baker, got out in under ten seconds before a crowd of 20,000 people. Like Houdini, the publicity gained was enormous. So influential was this one event, that Steve dropped the 'Gerhardt' name which he used because he was a comedy magician, and instead went with 'Mr. Escape'. The name 'Mr. Escape' actually came from the Steranko Issue of Genii. Steve talked to Jim Steranko and got his permission to use the name. David Copperfield presented a hanging straight jacket escape on one of his specials also from a burning rope. His twist was to be suspended with three flaming ropes which would burn through one by one and to hang over flaming spikes! 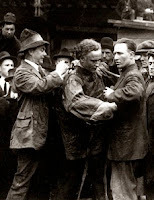 Lance Burton presented the hanging straight jacket escape a number of times on TV and in front of an audience during the dedication of the HOUDINI Postage Stamp and also escaped from a straight jacket while inside a very small water torture cell like device. Dean Gunnerson hung upside down by his feet with no ankle restraints over Hoover Dam and escaped from a straight jacket, yet another dangerous twist. Then there are the comedy magicians who use the routine for laughs rather than as a genuine escape. The comedy for them is the driving force. I have seen comedy routines that are funny, even hysterically funny. But most use tired old lines and gags and seem more like a filler routine than anything. Once the person is inside, they are out in no time. Most of the comedy routines just miss, for me at least. There are the lightning fast escapers. Again, not a fan of folks who get out lighting fast. 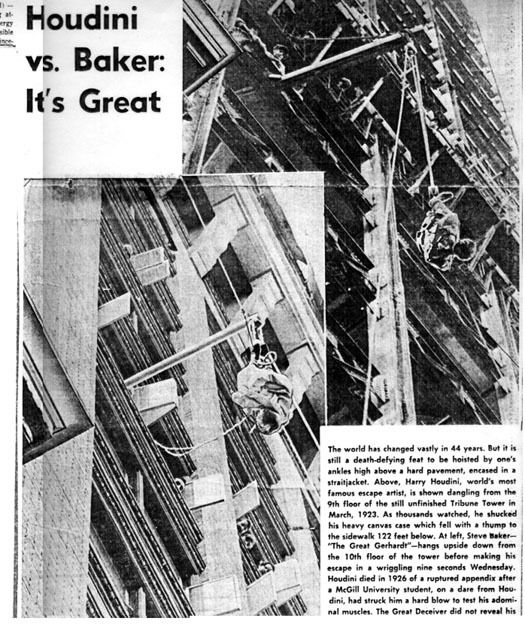 Steve Baker got out in under 10 seconds and it kicked off his career as an escape artist. But honestly, though we are friends, I'm not on board with the speed aspect. I watched a video of Norman Bigelow getting out of a straight jacket recently. His approach was slow and steady and it genuinely appeared difficult. THAT is the way to do it. IF you can get out super fast, my first thought is, you weren't in it very well. And you can bet that lay people are probably thinking the same thing. Maybe the best modern day hanging straight jacket escape was presented by Penn & Teller. Theirs has comedy in it, but they also have a great deal of suspense. Teller is hung in the jacket while Penn holds onto the rope reading 'Casey at the Bat'. Teller has to free himself before Penn finishes reading otherwise Penn will let go of the rope. Penn reads faster and faster as the routine progresses. It is funny, but it also has incredible tension. 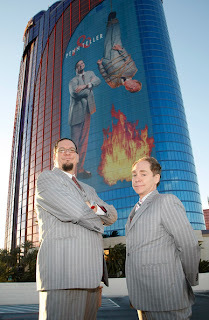 Penn and Teller have made the trick their own. Watching their performance doesn't make you think about Houdini, it makes you think about this poor lil guy getting out of the jacket before his crazy buddy drops him onto a bunch of spikes! It's a great routine. Have you ever personally been inside a straight jacket? I'd guess that at least a few readers of this blog probably have, not because you're crazy but because you are probably magicians. The first straight jacket I wore was not a real straight jacket at all, but instead a large jacket with long sleeves that had the sleeve ends tied off with rope rope and then used the rest of the rope to wrap numerous times around the jacket. It simulated a straight jacket quite well. I was an adventurous and creative youth. When I finally did encounter an actual straight jacket, it was a Posey brand canvas jacket, the real thing. It was also too small for me. A friend put me in it and I could hardly breath, that is how tight it was. If you know anything about straight jacket escapes, you'll know I've already broken a couple cardinal rules of getting out easily, too small of a jacket and putting it on super tight. For the first minute I just relished the thought of actually being in a straight jacket, it was really cool. Then I decided to attempt the escape. I can't say that I got out in 6 seconds like many so-called record breakers claim. It took me a couple minutes to free myself from a jacket that was way too small and way too tight. I was thrilled to have gotten out and frankly a bit relieved. Years later I opted for a Steel Straight jacket. Mine is a reproduction of the one used in the Tony Curtis Houdini movie. In 2008, I presented the escape twice at the National Theatre in Washington D.C.. I was curious about the often quoted notion 'that modern audiences wouldn't sit through a long drawn out escape'. I decided to test the waters during the first performance. I struggled and struggled and struggled to get out of the steel jacket, sweat poured down my face, my shirt was ripped, I 'sold' that routine with every ounce of energy I had. Shocker, the audience sat for the entire thing and it really hit them hard. The second show, I did a more traditional presentation, getting out along with the recorded music background. Guess which one got the stronger reaction? The LONNNNG one! Oh, in case you're wondering, that is an air tight plastic box my head is locked in. I had to get out of that first, and then the jacket. Today, the straight jacket escape has been way overdone. It's like the Zig-Zag Lady in the 1980s. Many magicians use jackets that are way too large. If you look like you are swimming in the jacket you've lost an important element in the appearance of being secure. Do a Google search for 'straight jacket escape' and look at the number of images of people you've never heard of doing the escape. IF that many people can do it, is it really hard? I've written about the Straight jacket on one of my older blogs quite a bit. I have a love hate relationship with it. In Houdini's day, it was a fantastic escape. After Houdini died, most of us have just been doing a cheap imitation of his escape. The majority of people using a straight jacket escape in their act don't have a clue how to deliver a striking escape with it. Watch Houdini, if he was presenting it onstage he was rolling on the floor, gyrating around, he knew how to sell it! On the flip side, watch Tony Curtis's escape from a straight jacket while portraying Houdini. His escape goes in the opposite direction, very little movement, complete concentration, his is also quite engaging. David Copperfield used this very same technique when he was strapped in a straight jacket during his Escape From Alcatraz Special. Some people do know how to deliver a good escape, but they are in the minority. Sadly, many presentations today are more about the crotch strap jokes and then getting out as fast as possible. Even hanging upside down doesn't seem to be as big a deal anymore. The thing that scares me about the abundance of people trying the hanging straight jacket is that it is legitimately dangerous* and people can and do get hurt. A while ago I was thinking about the Pendragons, and how against all odds, when everyone was doing the Sub-trunk, Sword Basket and Broom Suspension, they took those three illusions and built a career on them by adding something unique to each routine. They were able to presentations that were so compelling that people associate those effects with them. I wondered, what was missing with the regulation straight jacket escape? What had not been done? 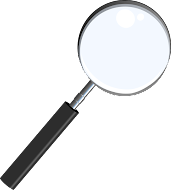 It appeared that everything had been done: on the stage, in the air, upside down, underwater, over spikes, you name it, and it's been done. Or at least I thought. A few months ago I had an idea for a new approach. A new angle that hadn't been tried. I spoke to Steve Baker about it. He thought it was brilliant. I shared it with Norman Bigelow, who said it was 'new, fresh and different'. There are a few obstacles yet to overcome so I can't divulge what it is. But trust me, I'm working hard on it, time will tell if it pans out. In the meantime, my hats off to my fellow performers who are using the jacket the way it was meant to be used, to bring thrills to an audience. 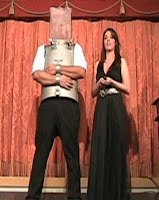 The most recent one was Wayne Houchin, who presented the straight jacket while hanging upside down. He has done the escape before, and has a safety crew there to assist him, he is smart and careful. I'm not sure Houdini would be proud of us though, because he didn't really like anyone doing his stuff. But he might be amazed to know one of his creations is still be used over 80 years after he left this earth. Just because a lot of people have presented a hanging upside down straight jacket escape, doesn't mean YOU should. If you do, DO NOT go into it lightly. I know of a fellow in Memphis TN who fell while hanging upside down in a straight jacket. The doctors told him the only thing that saved him was the jacket still being on, but otherwise he should have died. He was lucky. Alan Alan, the escape artist from England, has fallen while hanging upside down and been injured. He once came up with a crazy idea of setting the jacket itself on fire. He got hurt with that too! I know of a fellow who tried to do the straight jacket escape in the heat of the summer with a jacket that was too small. He did not get out. He struggled so much he actually caused a rip in the thick canvas. He also could have seriously injured himself. The straight jacket escape, hanging or not hanging can be dangerous. To think otherwise is foolish. Take every precaution while learning. Always have safety people standing by. To put yourself in serious danger is just plain stupid. You'd be better off learning from a professional who knows the ins and outs of the escape. The worst thing about escapes is 'magicians' think they are easy. 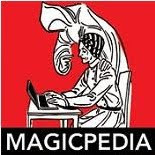 I can't tell you the number of stories I've heard about magicians who went into some escape trick thinking it would be sensational and easy and they were hurt or even killed. Hmmm, maybe that's why so many people use the straight jacket as a comedy routine, it's safer and you live longer! Maybe they are on to something after all. You know, you are right about Tony Curtis's portrayal of the straitjacket escape in the film. That is precisely why I found it so compelling. No movement! You know what drives me nuts -- those who have the jacket put on with their arm slung high up on their shoulder. They are half out of the darn thing! You are supposed to have your arm FOLDED.